Chefs Carrie Nahabedian and Michael Costa (center) with ATP founder Carolyn Mugar and executive committee members Julia Mirak Kew and Anthony Barsamian, Armenian Consul to Chicago Oscar Tatosian, Armenian Assembly executive director Bryan Ardouny and other special guests at the Zaytinya benefit dinner. This year's Smithsonian Folklife Festival highlighted Armenia with two weeks of exhibitions that were visited by hundreds of thousands of people on the National Mall. The "Armenia: Creating Home" festival featured artisan craft traditions, wine, food, art, and music. Armenia Tree Project (ATP) and the Armenian Assembly of America sponsored the opening reception at the National Museum of African American History and Culture. 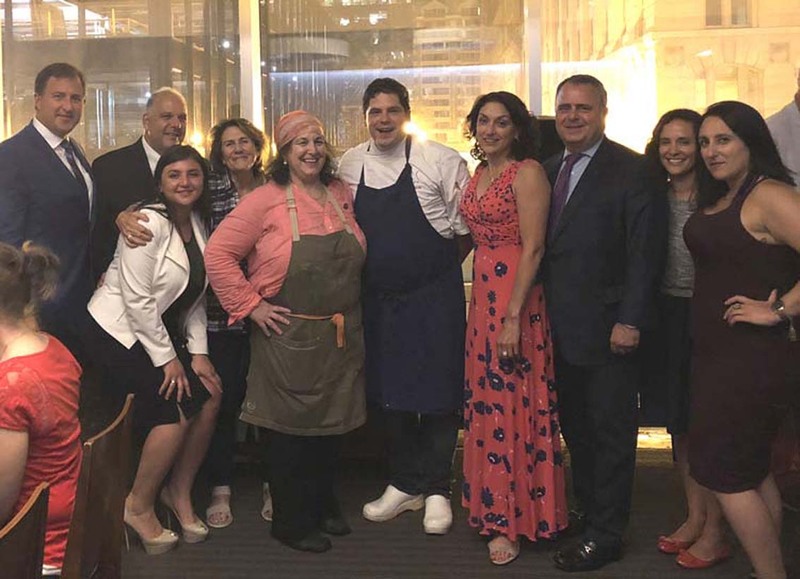 In addition, Chef Carrie Nahabedian partnered with the popular Mediterranean restaurant Zaytinya to host an Armenian-inspired dinner experience where proceeds were donated to ATP. Guests from across the globe gathered at the opening reception on June 27, where Smithsonian Folklife Festival Director Sabrina Lynn Motley and ATP founder Carolyn Mugar welcomed everyone. As one of the sponsors, Carolyn thanked Smithsonian and welcomed Armen Sarkissian for his first official visit to the US as Armenia's president. "Armenia is celebrating a milestone this year--100 years since a modern nation was formed and a quarter century of democracy and independence as a young nation," she said. "As we celebrate 'Armenia: Creating Home,' we celebrate Armenia’s music, art, food, wine, and culture through the centuries. We are actually celebrating Armenia's people, spirit, and genuine hospitality." "This is an exciting and important time for America and Americans to engage with Armenia and Armenians. I believe in direct tangible investment in Armenia, actually putting a shovel in the good earth," Carolyn continued. "I believe in Armenia’s people, their many talents, their need to grow fruit and to make wine, and to promote a healthy environment abundant in trees and clean water." "Armenia is not merely a small country in the Caucasus...it is one of the wellsprings of world civilization, on the same level as Mesopotamia, Egypt, Greece, and Italy," stated former Ambassador Michael Gfoeller, who was previously the Deputy Chief of Mission stationed in Armenia. "Whoever bakes or eats bread, makes or drinks wine, uses metal tools or jewelry, or wears clothing and shoes is tied by invisible bonds of cultural inheritance to Armenia." Guests in attendance included US Ambassador to Armenia Richard Mills Jr., former US Ambassador to Armenia John Heffern, US Agency for International Development Mission Director Deborah Grieser, Armenian Minister of Culture Lilit Makunts, and Armenian Ambassador Grigor Hovhannissian. Read more about the opening reception here. The night before, Chef Nahabedian's event at Zaytinya sold out quickly. Carrie, co-owner of Naha and Brindille in Chicago, is a long-time supporter of ATP. "Food is a big part of Armenia's identity," noted Carolyn. "I am delighted to hear how fast Carrie's dinner collaboration with Zaytinya sold out, which gauges the high interest in Armenian cuisine. Thank you to Chef Nahabedian for donating the proceeds of the dinner to ATP, which will help Armenia become more sustainable." Carrie joined Zaytinya's Chef Michael Costa to prepare sou boureg, an Armenian dish made with layers of handmade noodles and cheese. The festival featured cooking demonstrations and an opportunity for guests to participate in cooking classes and taste regional specialties like ghapama (stuffed pumpkin) and gata (Armenian cake) in between wine tastings and cheese-making classes. Finally, ATP was a sponsor of the interactive Tree of Life installation during the festival. Armenia's engagement with the "tree of life" dates back to time prior to the dawn of Christianity. Living trees in the churchyard have also take on spiritual significance. "People hang pieces of their clothes or the clothes of sick relatives on the branches," explained anthropologist Levon Abrahamian, "anticipating health or curing." Some sacred trees are conceptualized more broadly as "trees of wishes" where anyone may express a wish and leave a token of themselves behind. At the Smithsonian Folklife Festival, organizers blended the tree of life tradition with the art of crochet, inviting visitors to learn crochet, create personalized designs, and attach them to the limbs of a wooden tree-like scaffold. ATP benefactor Levon Der Bedrossian was so moved by the Tree of Life installation on the National Mall that he agreed to create a space for it on the patio of his Silk Road Hotel, a boutique hotel in Yerevan, after the conclusion of the event.